UNDATED - For the week ending Sunday, most producers completed fall harvest and other field activities following unseasonably warm weather across much of South Dakota, according to the USDA's National Agricultural Statistics Service. However, the dry conditions and lack of snow cover were unfavorable for winter wheat. Drought conditions continued across much of the west. There were 6.7 days suitable for fieldwork. Topsoil moisture supplies rated 19 percent very short, 25 short, 54 adequate, and 2 surplus. Subsoil moisture supplies rated 27 percent very short, 26 short, 46 adequate, and 1 surplus. This is the last weekly Crop Progress and Condition report for the 2017 growing season. We would like to extend our appreciation to the dedicated county FSA and extension staff who supplied the necessary information for these reports. For December through March, we will issue monthly reports. The first monthly report will be issued in January. Weekly reports will begin in April for the 2018 season. 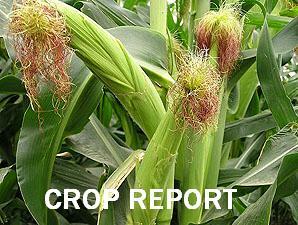 Corn harvested was 97 percent, near 99 last year and 98 for the five-year average. Winter wheat condition rated 25 percent very poor, 13 poor, 44 fair, 17 good, and 1 excellent. Sorghum harvested was 95 percent, behind 100 last year, and near 98 average. Sunflowers harvested was 94 percent, behind 99 last year, and equal to average. Pasture and range conditions rated 34 percent very poor, 21 poor, 23 fair, 21 good, and 1 excellent. Stock water supplies rated 21 percent very short, 30 short, 47 adequate, and 2 surplus.